This past Saturday was my birthday, so we decided to spend the weekend up in the mountains, and we booked a hotel in a place we’d never been to before – a tiny village in the canton of Valais called Evolène. Upon our arrival, we were welcomed by the sound of cow bells clanging in the streets. This seemed a bit odd because, not only was it the dead of winter, it was also well after dark, so any cows that had ventured out in the cold should have been home long ago. The mystery was solved at dinner when we had our first encounter with one of Evolène’s own “peluche”. In the month leading up to the big Carnival celebrations just before Lent, the local lads dress up in scary masks and costumes made up mostly of animal skins and furs. They then roam around town ringing bells and terrorizing locals and tourists alike. This is all in good fun, of course, and the worst that happened was that Nick got his hair ruffled a bit (and was told that he smelled like alcohol). Our arrival on 16 January happened to mark the first night of these shenanigans. Now, before I describe our dinner, I believe a word about Swiss cuisine is in order. As you might expect from a country famous for its rugged mountainous landscape and its cheese, traditional dishes are remarkably similar to each other and are invariably made up of a combination of potatoes, bread, cheese and/or pig flesh, with nary a vegetable in sight. This makes them pretty difficult to veganize: try taking the animal products out of fondue and you’re left with… bread. Try doing the same with rösti and you’ve got… potatoes, and maybe a few onions. Raclette? Potatoes. Tartiflette? Potatoes. You get the idea. When traveling in Swiss cities, or even in reasonably sized towns, this actually doesn’t pose much of a problem, because no one really eats these dishes ALL the time, and interspersed with the fondue restaurants are plenty of places serving Italian, Chinese, Indian, Thai or Moroccan cuisine. Head up into the mountains, though, and it’s a different story. I thought it might be worth doing a bit of research ahead of time, so after looking at a few menus and online reviews from travelers I contacted a promising-looking restaurant called Le Refuge. 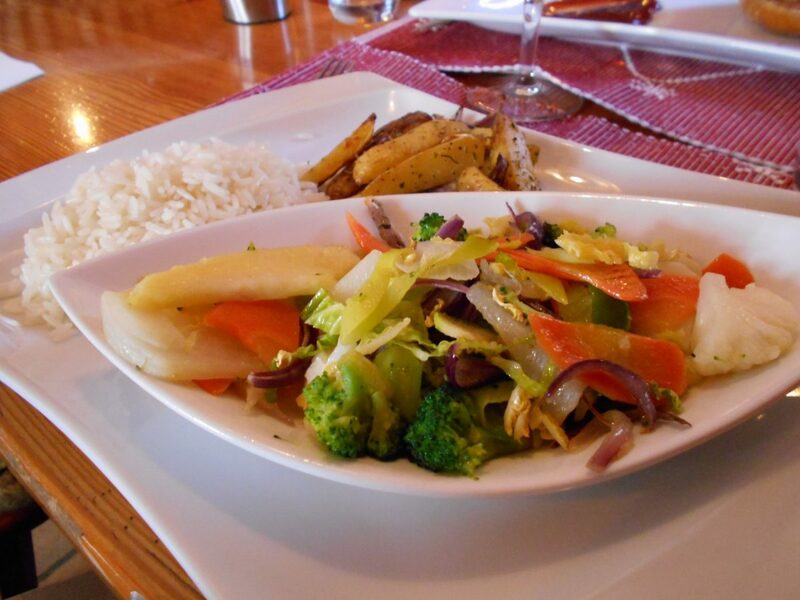 The main reason I chose this place was that one of their three-course set meals (menus in French) was vegetarian and looked as if some of the options might already be vegan. The owner, Véronique Vuignier, replied to my email straight away and said that they would be more than happy to prepare a vegan menu for me. We were saving Le Refuge for my birthday dinner on Saturday night, though, so on Friday, we decided to try our luck at one of the other restaurants in the village. 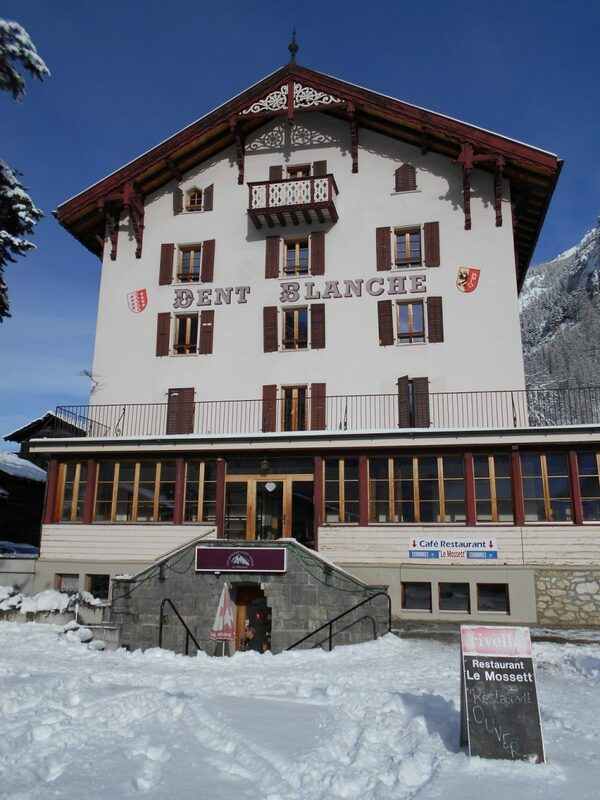 We ended up at La Dent Blanche, which was where we encountered the “peluche” [UPDATE August 2018: It appears that La Dent Blanche has permanently closed]. 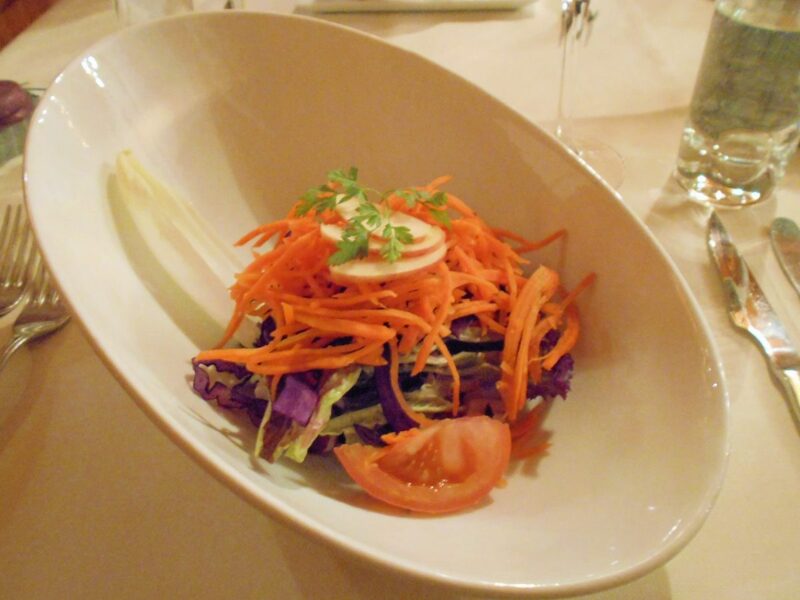 The vegetarian section of the menu consisted of one item – spring rolls. I found this a bit odd, actually, because there were plenty of other options that were in fact vegetarian (just not vegan). The dish Nick ordered, for example, was touted as a local specialty and consisted of roasted potatoes with cheese melted on top. I have noticed that most Swiss restaurants tend to offer at least one token “vegetarian” dish, and it’s a bit of a mystery to me why they often don’t consider their own meat-free local specialties to fit into this category. Perhaps it’s due to a mindset of pigeonholing vegetarian as something weird and foreign, even though omnivores, of course, eat vegetarian and vegan food all the time. In any case, the server enquired with the kitchen staff about the spring rolls and informed me that they were not just vegetarian but also vegan. 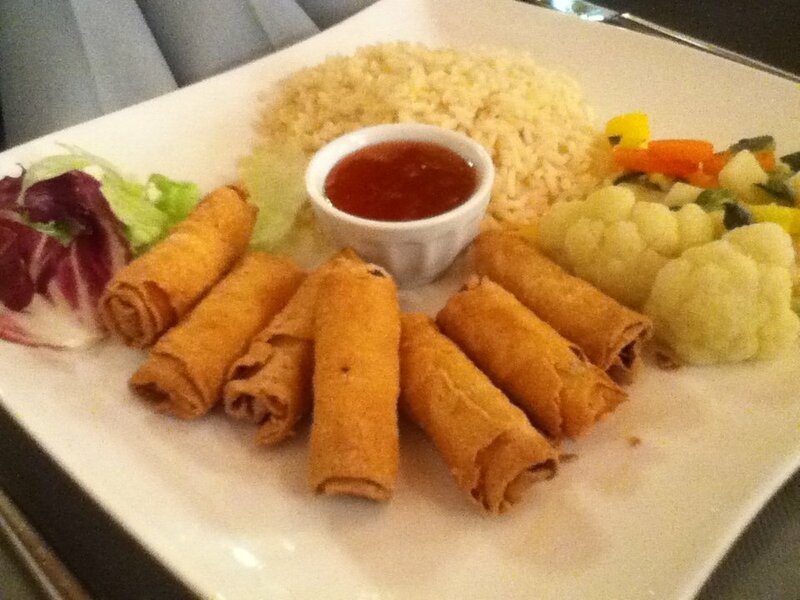 It turned out to be a lovely meal of spring rolls served with sweet chili sauce, steamed vegetables and rice. On Saturday we woke up to a blanket of snow outside our window, and the snow continued to fall all day. This was the best birthday present the universe ever could have given me. Growing up in Alabama, I only saw snow a handful of times, which meant that the few times when it did so were a HUGE deal. Something so rare naturally takes on a special, almost magic quality, and I’ve never lost my fascination with snow. Sadly, we seem to be getting less and less of it in Geneva these days, which just makes these trips up to the mountains all the more special. I wasn’t feeling terribly motivated to go out INTO the snow, though. I tend to set high standards for myself when it comes to being productive and accomplishing things, but my birthday is one day of the year when I feel justified in taking a day off to just relax and do nothing. The only time we left the hotel room was for meals, and even then we didn’t go far. 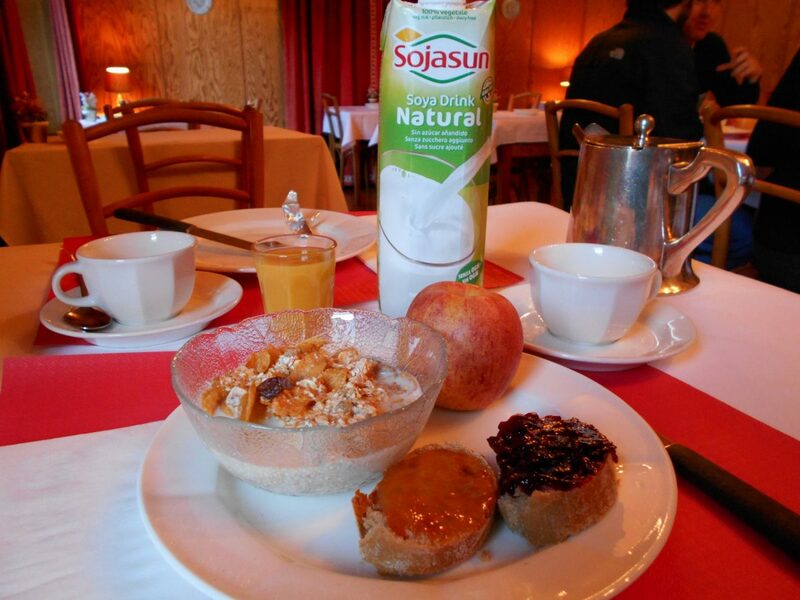 Breakfast was easy, as it was included in the room price at Hôtel Hermitage, as is usually the case in Swiss hotels. This was the first time I had bothered contacting the hotel ahead of time and asking them to provide soy milk in addition to the standard offering of cow’s milk, and they agreed straight away. I’m finally learning that all you have to do is ask for what you want and people are generally happy to oblige. The kind owner even gave me the rest of the 1-liter carton to take home upon our departure, saying that her family doesn’t drink it. Since I didn’t want it to go to waste, I agreed, though perhaps I should have encouraged her to try offering it to guests to see how much demand there was for it. 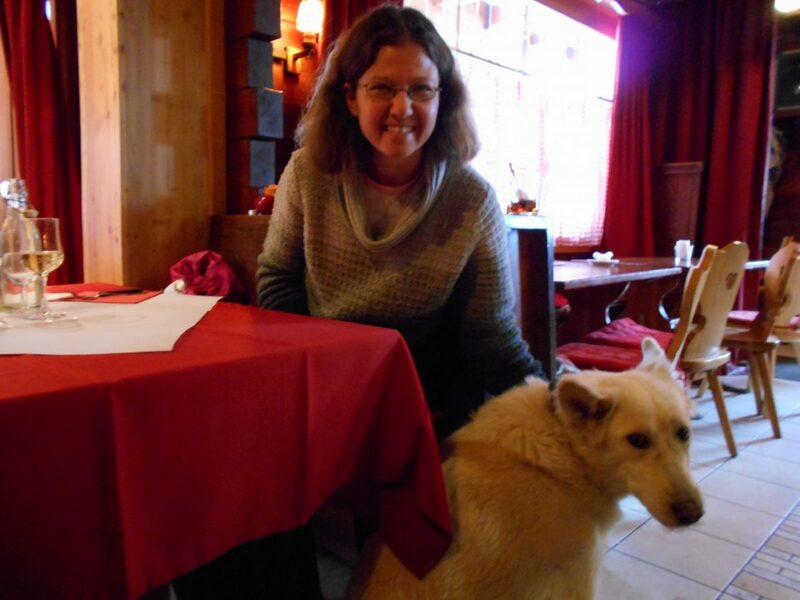 For lunch, we ended up at a well-known local establishment called Chez Raymonde, also known as Le Vieux Mazot. I had read mixed reviews and thus wasn’t sure what to expect, but the owner Raymonde and her staff were very friendly and tried their hardest to accommodate me, even though the best they could do was salad and roasted potatoes. 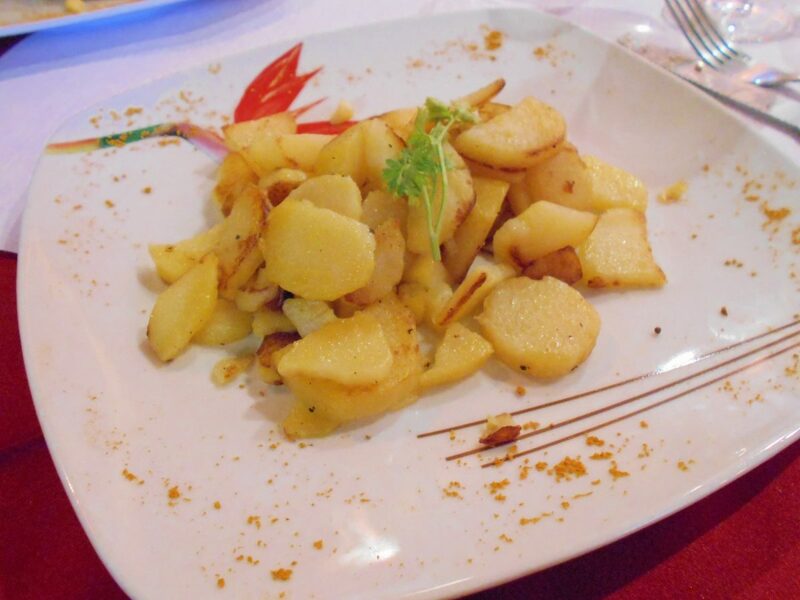 While I would not normally make a full meal out of a plate of potatoes, I must admit they were pretty delicious. And since I did nothing but lie in bed and read all day, they did their job of keeping me full until dinnertime. For me, though, the best thing about lunch was the company. You just never know who’s going to join your table in Evolène! While we were waiting for our food, Raymonde passed by our table with this gorgeous dog on a leash, who was obviously unwilling to follow her and instead plopped down on the floor right beside me. Raymonde explained that the dog, whose name was Spooky, wouldn’t follow her outside if she wasn’t wearing a coat, because he knew that meant she was just going to leave him outside in the cold rather than take him for a walk. She then proved this theory by handing the leash over to a staff member in a jacket, and, wouldn’t you know it, Spooky jumped up and followed the girl outside. And people think animals are unintelligent! Spooky was back before long, and the whole time we were there he stayed either next to me or at the table just behind me. Our nomadic lifestyle doesn’t really allow us to have companion animals in our lives, so I treasure these moments I get to spend with the animals I meet. 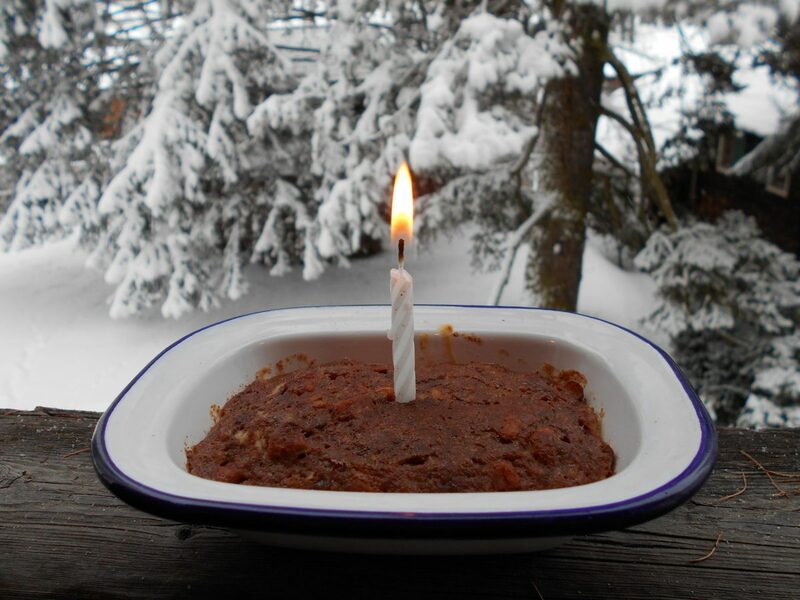 That afternoon we celebrated with a bit of birthday cake I had baked beforehand and brought with us (recipe courtesy of Chocolate Covered Katie). That evening we headed to Le Refuge for what I suspected would be a memorable birthday dinner. I was not disappointed! It was obvious from the moment we walked in that this place was a step up in quality from the more tavern-like restaurants in the village, and the service and presentation were both far superior to what we had experienced thus far. 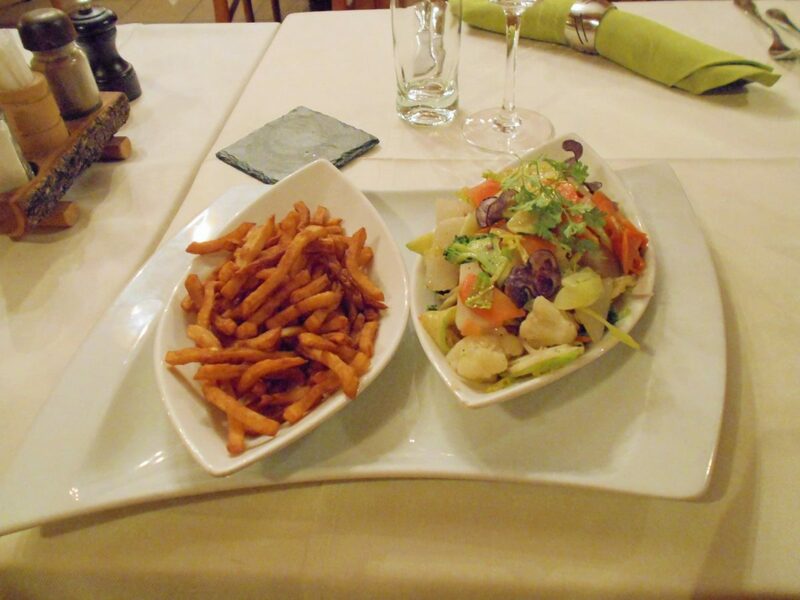 and was followed by sautéed vegetables, which were served with French fries (instead of the usual gratin dauphinois, which contains crème fraîche). 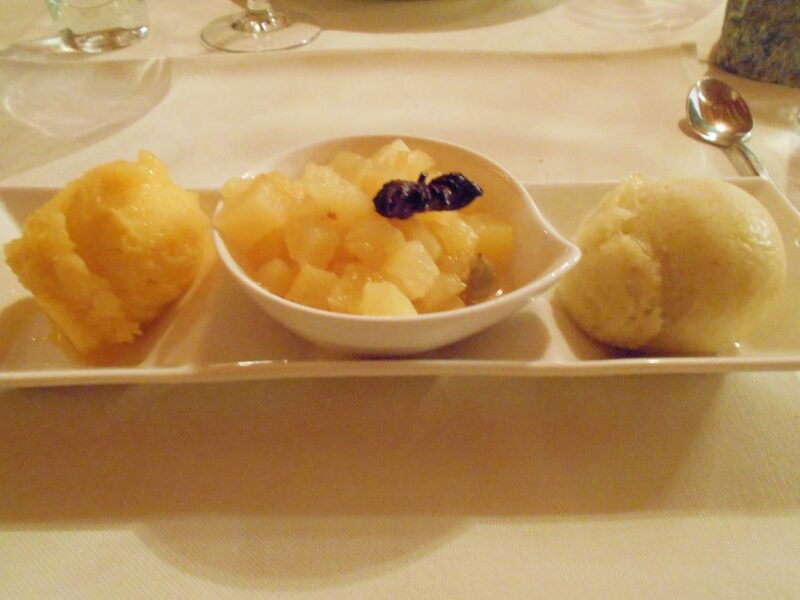 For dessert, I was offered a choice of homemade sorbets with pineapple slices. In the end, I chose one scoop of pear sorbet and another scoop of mandarin orange. It was delicious! We were so impressed with this place that we returned the next day for lunch. I had seen pasta and risotto on the menu and thought those dishes could probably be made vegan, but as it turned out the pasta was tagliatelle and was thus made with eggs, while the risotto had been prepared in advance and contained both cream and cheese. So, I ended up with sautéed vegetables again, but Veronique did her best to add some variety by serving it with rice and garlic potatoes this time. The garlic potatoes were scrumptious; I much preferred them over the French fries. And to top it off, she even offered to bring me a second helping on the house – an offer I could hardly refuse. I recommend Le Refuge without hesitation, though I also recommend that you reserve in advance and let them know that you need a vegan meal. If you plan to eat more than one meal there, let them know that too and I’m sure they will be happy to create something new and different for you. While I did contact them in advance, I did not specify exactly which date we would be coming. Véronique let me know that if I had done so then they could have set aside a portion of vegetable soup for me before adding the cream, for example. So, I learned a valuable lesson for next time, but even without the vegetable soup I thoroughly enjoyed the meals I ate in Evolène and was once again pleasantly surprised at how easy it is to be a vegan traveler, even in a remote mountain village in the heart of cheese country in the Swiss Alps. All it takes it a bit of flexibility and the cooperation of some kind and helpful souls, which seem to be in abundance in these parts. 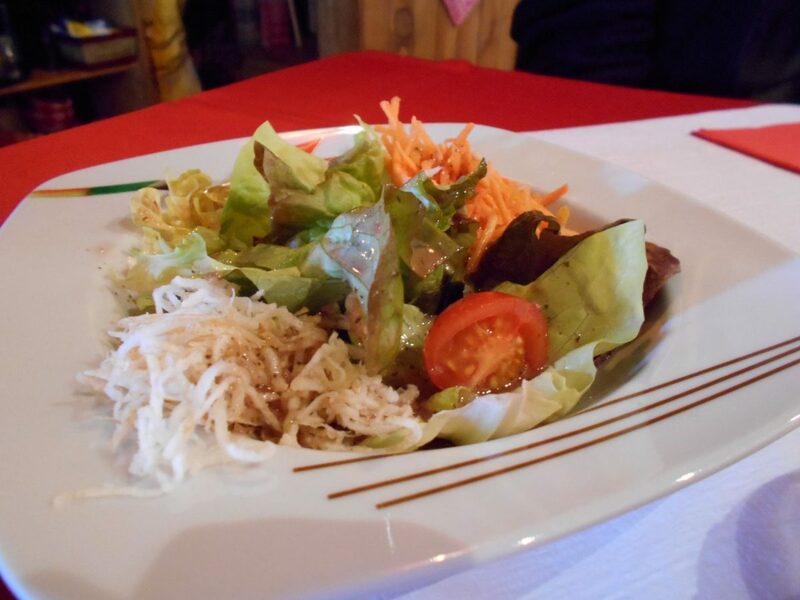 Is Your Vegan Tummy Growling in Graubünden? Not Anymore!